Sea turtles find a paradise in the protected waters off the coast of Nicaragua. 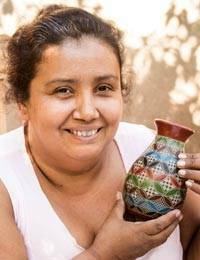 Maria Arauz carries on her family's artisan legacy with this handcrafted ceramic vase. 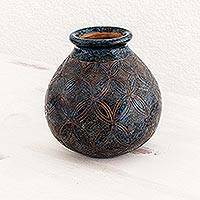 Its rich colors are derived from cobalt oxide and colorful stones that are ground and mixed with liquid clay. 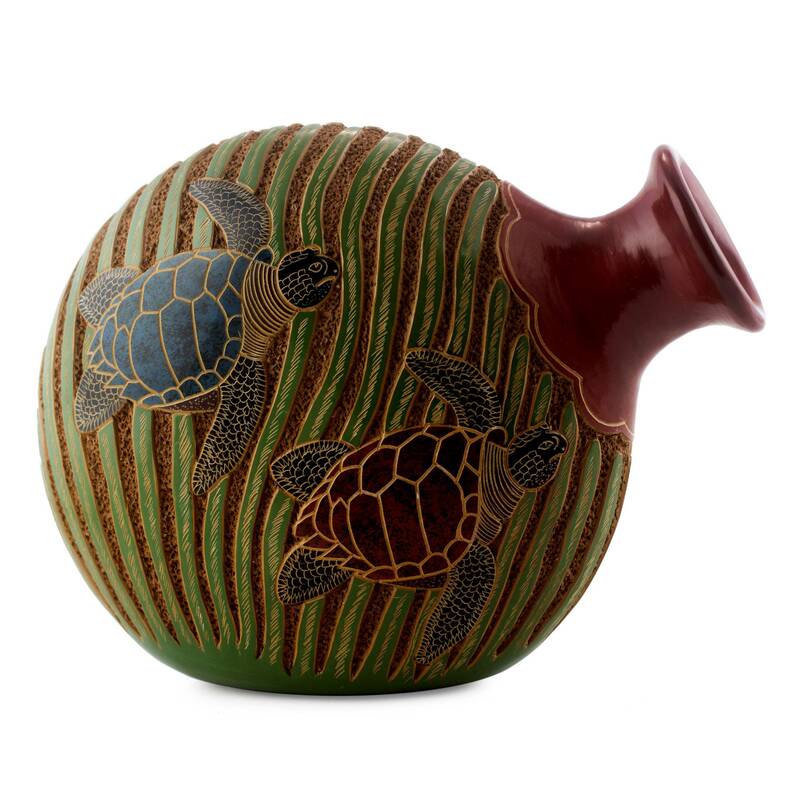 Artfully crafted by Maria Arauz from Central America. "I've always thought that being born in my town is like being born with ceramic tools in our hands. The craft is in our blood." "I'm María Eugenia Munguía Arauz. I was born March 4, 1975, in San Juan de Oriente, Nicaragua. I've always thought that being born here is like being born with ceramic tools in our hands. The craft is in our blood. 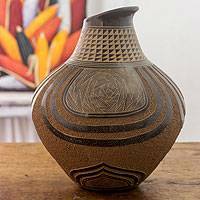 "My parents are ceramists and both craft pre-Hispanic replicas. So I grew up with two master artisans at home and they couldn't have been better teachers. 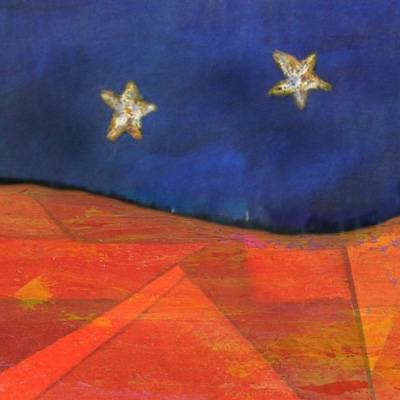 As a little girl, I was enchanted by the variety of colors they achieved and how they were able to create true works of art from a lump of clay. 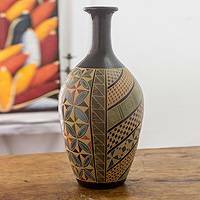 "Necessity eventually led me to set up my own workshop, as our traditional ceramics are a source of sustenance for my family. Just as my parents taught me, I am teaching this art to my children. I've always believed that my knowledge and ability to work are the best possible legacy, and this is what I want to hand down to my own descendants. "I work together with my family. My husband does the designing and our oldest son prepares the pieces for him. I add the colors, then the pieces go back to my husband so he can calculate and divide the fields for the motifs. I then create the details in low relief. Finally, my husband fires our ceramics and polishes them. 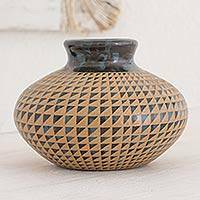 "What I most enjoy about this work is imagining new shapes and designs, and transforming them into an actual vase or jar. The challenge is creating designs that shoppers like and buy. If they sell well, this tells me my work is valued, that people appreciate it. It will let me give my children a better life. "I love the culture of my town and of my country, especially the artisan culture. Each and every day, we all strive to be better craftspeople because the competition is tough and we need to find our own ways to continue being innovative and creative. "I consider myself to be strong, hardworking, honest and reliable. I want so much to get ahead in life and I work day by day to give my children more opportunities than I had. "As a person, I'd like to continue growing and developing my skills as a woman artisan. I'd like to improve our working conditions. My dream is to have a place of our own to live and share this with my family. "In 2010 when I was expecting my youngest son, it was a high risk pregnancy. But thanks to my family's care, I was able to bring a healthy baby into this world. As I see how he has grown, this is a reminder that life is fragile and we should take maximum advantage of all it offers us."